Tea is said to be the most popular beverage in the world. It’s been consumed for thousands of years by millions, perhaps billions, of people. Tea has also been shown to have many health benefits. And some of these benefits are thought to be related to tea’s antioxidant properties. These properties are from its flavonoids known as “catechins.” Flavonoids are anti-inflammatory and have a range of health benefits that I talk about in this post. Green tea vs. black tea - What's the difference? What do green and black teas have in common? First of all, they both come from the camellia sinensis shrub that’s native to China and India. Green tea contains slightly more health-promoting flavonoids than black tea. How is this? The difference lies in how they’re processed. If the leaves are steamed or heated, this keeps them green. The heat stops oxidation from turning them black. Then they’re dried to preserve the color and flavonoids which are the antioxidants. Hence you have green tea. If the leaves are not heated and are crushed and rolled, then they continue to oxidize until they’re dry. This oxidation uses up some of the flavonoids’ antioxidant power, so black teas have slightly less ability to combat free radicals than green tea does. PRO TIP: Adding milk to your tea reduces the antioxidant ability. Both green and black teas contain about half of the caffeine in coffee. That translates to about 20-45 mg per 8 oz cup. Tea drinking, in general, seems to be associated with good health. Heart health - For one thing, both green and black tea drinkers seem to have high levels of antioxidants in their blood compared with non-tea drinkers. Green and black tea drinkers also have lower risks of heart attacks and stroke. Drinking green tea, in particular, is associated with reduced triglycerides, total cholesterol, and LDL oxidation, all of which are risk factors for heart conditions. Overall, drinkers of green and black tea seem to have a lower risk of heart problems. Green tea has also been shown to reduce risk factors (i.e., blood lipid levels) a bit more than black tea has. Cancers - Antioxidants also reduce the risk of many cancers. Studies show that both green and black teas can reduce the risk of prostate cancer (the most common cancer in men). Also, green tea drinkers have a lowered risk of breast and colorectal cancers. Black tea is being researched for its potential to reduce the risk of ovarian cancer. 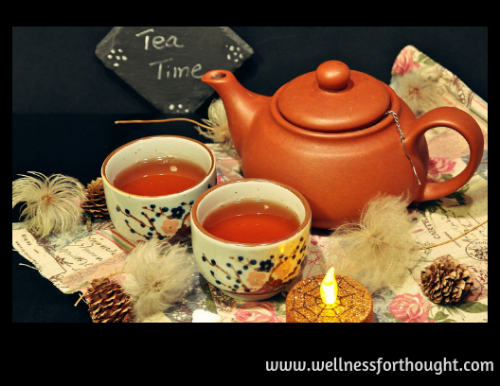 Overall, antioxidant flavonoids in tea seem to help reduce the risk of some different cancers. Green tea may have a slight edge over black tea, but both seem to be associated with lower cancer risk. Diabetes - Both green and black teas can reduce the risk of developing type 2 diabetes. They also reduce diabetes risk factors, like elevated blood sugar levels and insulin resistance. For example, some studies have shown that both green and black teas can help reduce blood sugar levels. Other studies have shown that green tea can also improve insulin sensitivity. Once again, green tea seems to have a slight edge over black tea, but both are blood sugar friendly (just don't overdo the sweetener). Both green and black teas are from the same plant but are processed differently. Green tea retains more of the beneficial antioxidants than black tea does, but both are associated with better health than non-tea drinkers. Overall, both green and black teas are healthy drinks, and tea drinkers, in general, seem to have fewer health conditions than non-tea drinkers. Green tea seems to have a slight edge over black tea when it comes to measurable risk factors for some common diseases. When you enjoy your tea, try to minimize or even eliminate adding milk and/or sweeteners; these reduce some of the health-promoting properties of tea. I’d love to know: Are you a tea drinker? Which tea is your favorite? How do you like to enjoy it? Let me know in the comments below. Add all ingredients into food processor and pulse until blended.